I wanted to quickly mention this plugin as it saved me a bit of time just now. While I worked on this new blog I set the development site up at wordpress.agileadam.com. When I switched the agileadam.com domain over to point to this new WordPress site all of my images stopped working (because the img tags pointed to wordpress.agileadam.com urls; shouldn’t they be relative anyway!? I’ll look into that later). So, obviously I needed to correct the urls throughout all of the content. Normally I’d do a find/replace in the database, but I figured with my unfamiliarity with WordPress I’d search the plugin repository to see what was available. I came across Search Regex, thankfully. In a matter of one minute I was able to install the plugin and correct the incorrect image paths across all of the posts on my site. While my usage here was very simple, I’m thinking this will be a great tool to have on-hand as I spend more time with WordPress. 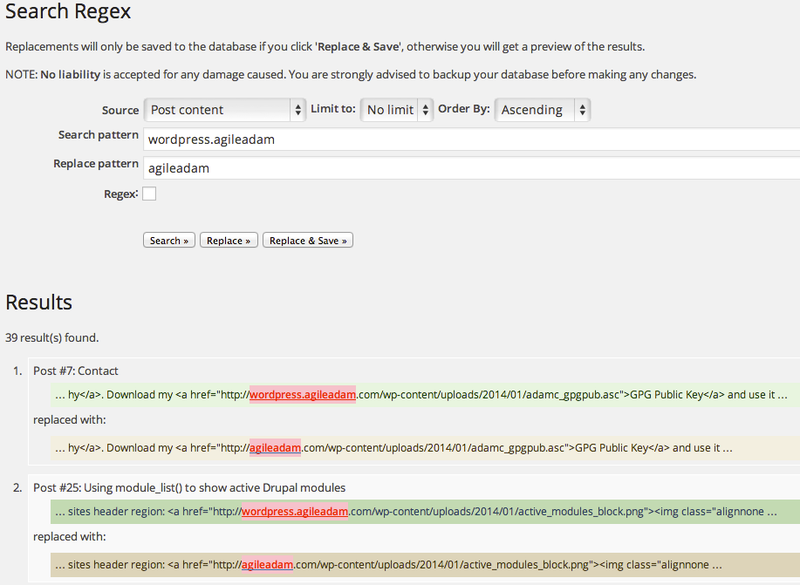 tl;dr: WordPress plugin installation is amazingly simple, and the Search Regex plugin works great. ‹ QuickLook Slow in Mavericks?